Drip tape can replace sprinklers and spray nozzles for watering vegetables, flower gardens, and landscaped areas. It provides regular, slow, and low-flowing water directly to roots. Connect a hose or pipes to a long, thin tube (think tape worm rather than sticky tape) that sits on or under the soil. The tape has small drippers to push into the soil every foot or so, leaking a constant trickle of water into the immediate soil area. The systems are better for plants, easier for gardeners and use water more efficiently than sprinklers or other options. Saves Water: If scheduled correctly and not set for excessive watering, drip irrigation is 20 to 40 percent more efficient than sprinklers. Drip tape water is not lost to wind, runoff or evaporation. This translates to lower water bills for an equally beautiful garden. Simple to install: Even in a large yard, drip tape irrigation systems are easy for homeowners to install. You can buy a complete drip irrigation system for less than $50. Just run the tape along the surface and push each dripper under the dirt. Either set an electronic controller or connect a faucet to the tape system. Simple to Use: With a faucet, just turn on the water for long enough to soak the roots. Once the tape is in place, you can skip the gymnastics of reaching tight spaces or oddly shaped corners of the yard. Using a controller is even easier. Just set it and forget it. If you expand or move a garden, move the tape or add an extra strip. If plants die, you also can plug individual drip holes. Good for Plants: Slowly feeding low volumes of water keeps the air and water balanced in the soil, and keeps moisture levels constant. Sprinklers and hose sprayers may cause the soil to fluctuate between soaked and parched, hindering plant growth. Space drippers properly. Too few drippers or overly wide spacing can restrict root growth. Check the system regularly for dry areas between spouts. Consider a filter to stop debris and other particles that could clog the spouts. Also buy a backflow preventer to keep dirt and other particles from flowing back into the household water system. Both filters are included in typical drip irrigation kits. Fasten the tape with anchor pins every two to three feet. This will help reduce the hazard of tripping over the tape, and keeps the tape from moving. Adjust the size and spacing of the spouts for different plants with different watering needs. One small spout should be placed above the core root system of new plants. Use several large drippers around trees or large, thirsty plants. Buy pressure-compensating drippers, which maintain constant flow regardless of water pressure. Stick to one brand of dripper to ensure consistent flow across the garden. Drip tape irrigation is easy to install and use, and is good for plants. 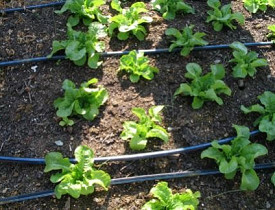 Click here for more detailed drip tape irrigation instructions.